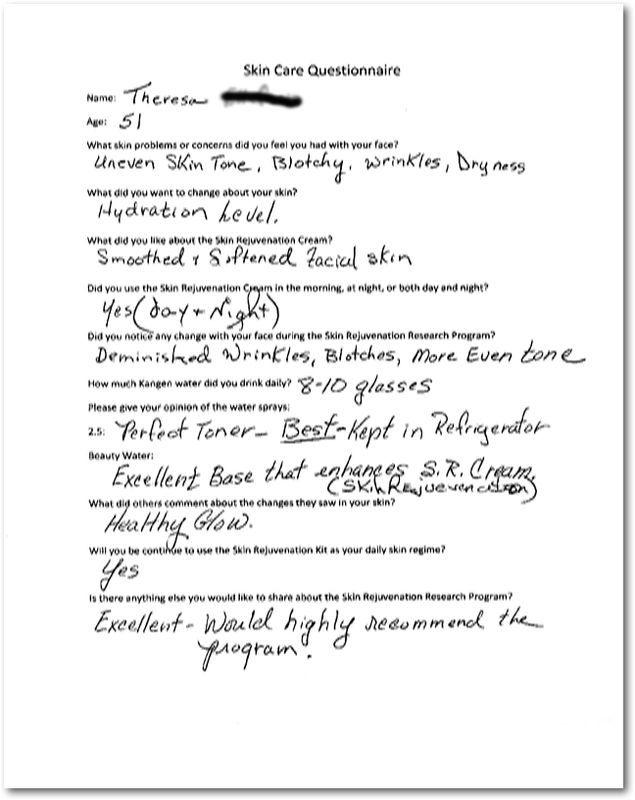 What clients of Dr. Paul Cosman are saying about the Total Skin Rejuvenation Cream and his skin care program. 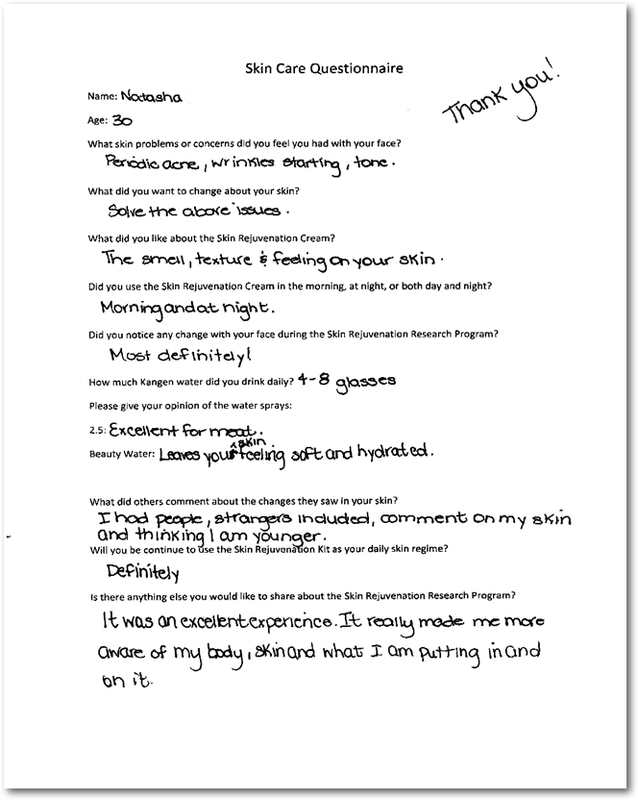 Actual Skin Care Questionnaire's from clients who took part in Dr. Paul Cosman's skin rejuvenation program. What skin problems or concerns dd you feel you had with your face? Periodic ace, wrinkles starting, tone. What did you want to change about your skin? Solve the above issues. What did you like about the Skin Rejuvenation Cream? The smell, texture, and feeling on your skin. Did you use the Skin Rejuvenation Cream in the morning, night or both? Morning and night. 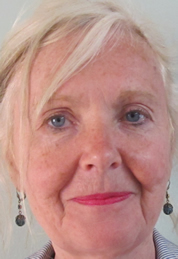 Did you notice any change with your face during the Skin Rejuvenation Reasearch Program? Most definitely! What did others comment about the changes they saw in your skin? I had people, strangers, included, comment on my skin and thinking I am younger. Will you continue to use the Skin Rejuvenation Kit as your daily skin regime? Definitely. 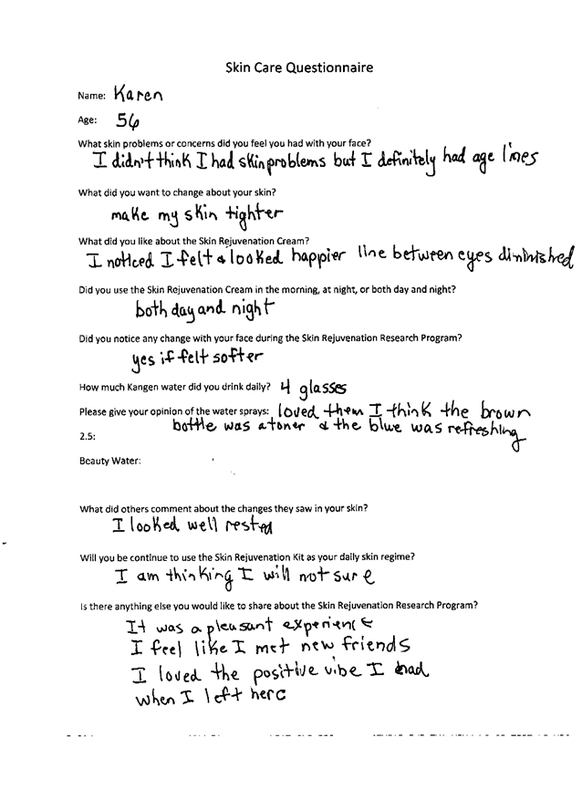 Is there anything else you would like to share about the Skin Rejuvenation Research Program? It was an excellent experience. It really made me more aware of my body, skin, and what I am putting in and on it. Questions about other products used in the program. More information on these products can be obtained by contacting us. How much Kangen water did you drink daily? 4-8 glasses. Beauty Water: Leaves your skin feeling soft and hydrated. What skin problems or concerns dd you feel you had with your face? Uneven skin tone, blotchy, wrinkles, dryness. What did you want to change about your skin? Hydration level. What did you like about the Skin Rejuvenation Cream? Smooth and softened facial skin. Did you use the Skin Rejuvenation Cream in the morning, night or both? Yes, both day and night. 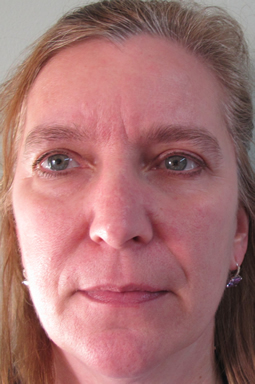 Did you notice any change with your face during the Skin Rejuvenation Reasearch Program? 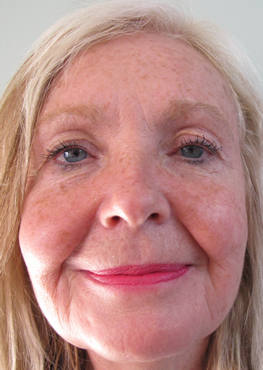 Deminished wrinkles and blotches. More even tone. What did others comment about the changes they saw in your skin? Healthy Glow. Will you continue to use the Skin Rejuvenation Kit as your daily skin regime? Yes. Is there anything else you would like to share about the Skin Rejuvenation Research Program? Excellent - WOuld highly recommend the program! How much Kangen water did you drink daily? 8-10 glasses. 2.5: Perfect Toner - Best kept in the refridgerator. Beauty Water: Excellent base that enhances the Skin Rejuvenation Cream. What skin problems or concerns dd you feel you had with your face? I didn't think I had skin problems, but I definitely had age lines. What did you want to change about your skin? Make my skin tighter. What did you like about the Skin Rejuvenation Cream? I noticed I felt and looked happier. Line between eyes diminished. Did you use the Skin Rejuvenation Cream in the morning, night or both? Both day and night. 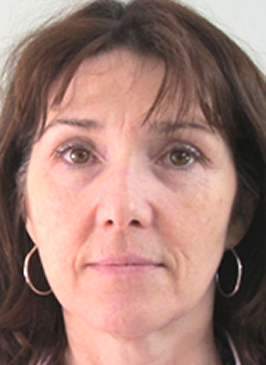 Did you notice any change with your face during the Skin Rejuvenation Reasearch Program? Yes, It felty softer. What did others comment about the changes they saw in your skin? I looked well rested. Will you continue to use the Skin Rejuvenation Kit as your daily skin regime? I am thinking I will, not sure. Is there anything else you would like to share about the Skin Rejuvenation Research Program? It was a pleasent experience. I feel like I met new friends. I loved the positive vibe when I left here. How much Kangen water did you drink daily? 4 glasses. What did you want to change about your skin? Wrinkles and Roscea. What did you like about the Skin Rejuvenation Cream? The smoothness and firmness. Did you use the Skin Rejuvenation Cream in the morning, night or both? Both. 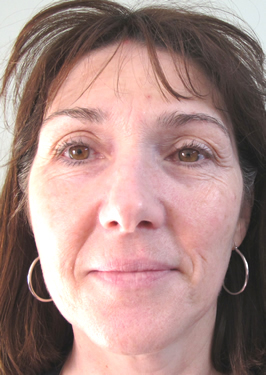 Did you notice any change with your face during the Skin Rejuvenation Reasearch Program? Firmer and calmer look. What did others comment about the changes they saw in your skin? Some noticed I looked younger, healthier. Will you continue to use the Skin Rejuvenation Kit as your daily skin regime?If I see a difference in the pictures, I will do what I can to fit this in my budget. Is there anything else you would like to share about the Skin Rejuvenation Research Program? It was an honor and pleasure to do this and learn so much. Thank you all!! How much Kangen water did you drink daily? 4-10 glasses. 2.5:Loved the smell (added), cleaned well, easy to use. What did you want to change about your skin? Clear up breakouts and put moisture back in skin. What did you like about the Skin Rejuvenation Cream? It makes my skin feel like a baby's bum. 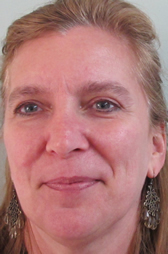 Did you notice any change with your face during the Skin Rejuvenation Reasearch Program? Softer, no bags under my eyes, tighter. Will you continue to use the Skin Rejuvenation Kit as your daily skin regime?Of course. Is there anything else you would like to share about the Skin Rejuvenation Research Program? Easy to use, amazing product. How much Kangen water did you drink daily? 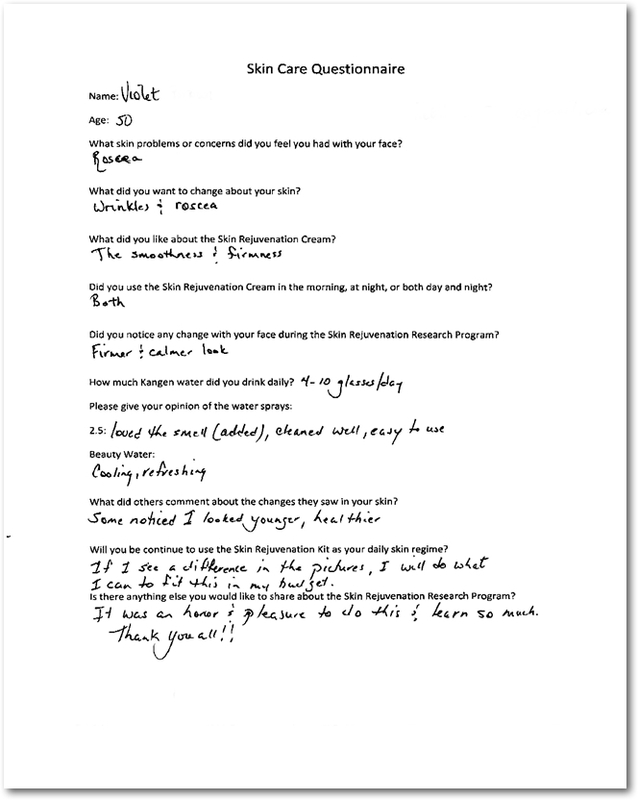 If you would like to leave your testimonial, please contact us.